How to Make Your Own Buttons with Crochet! Make Your Own Buttons with Crochet! Sifting through grandma’s coffee can full of buttons is one of those near-universal memories among crafters. What happened to all those cans? Some of you may have been lucky enough to inherit these treasure troves, but far too many of us are left with only the craft store. And they aren’t 10 cents a pack any more either. Whether it’s price or availability, being able to make your own buttons on the spot is a great skill to have! I’ve had lots of fun making my own buttons when the buttons I had on hand just wouldn’t do. Here are 5 different patterns and tutorials I found – one of which might be just what you need to finish your next project! A Simple Crochet Button by Mr. Micawber’s Recipe for Happiness – This is a fantastic photo tutorial and written pattern that makes a nice flat firm button. Easy go-to for any project! Buttons by Kathrin Bardeleben – You’ll be shocked this Ravelry download is free! So cute and such fine work. Offered in both English and German. 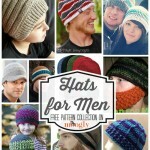 Unfortunately, this pattern set is no longer available. Valentine Button on Flower Girl Cottage – This big, bold button couldn’t be simpler! Crocheted Buttons: A Tutorial by Salt for the Spirit – This is another great photo tutorial, this time for a large but very sturdy button, made using drapery rings! How to Crochet Your Own Buttons by Emi Harrington – This one is a video tutorial, seen below. I love the simplicity and pop you get with these! 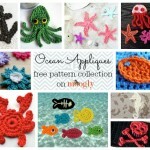 Buttons are fun, and now you can have a perfect match for every project – knit, crochet, or even fabric. The applications are endless! Have you ever made your own buttons? Is there another pattern you like to use? Share in the comments! 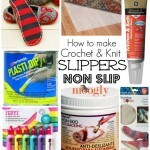 7 Great Ways to Make Slippers Non Slip! So cute, I will send this to my friends. You sound like you were whispering, like maybe there was a baby sleeping. Thank you so much for the tutorial. These tiny buttons are just precious.,,,do you by chance have a pattern for larger flower size buttons? I would be so grateful. I don’t have any specifically, but I bet almost any flower could be turned into a button! I really do love these buttons. I am imagining how to use each and everyone of these beauties. Hope everyone tries them and uses them in a variety of ways. You can put them on an outfit to make a change, make them to go in a little girls hair. There is so many ways they can be used. Wonderful tut! The greatest thing about crocheting your own buttons is that you can always match them perfectly to the color of a garment. Sometimes that is not easy to do when buying buttons. Love this place all the neat patterns and so many to chose from. Thank you so much! Happy Fall! I tried so hard to access the Kathrin Bardelebin pattern but could not get past the Ravelry pages. This happens so often with Ravelry, I now try to avoid the site. Hello Patricia! I’m sorry about the trouble! It looks like she has taken her pattern down since I posted this in 2012 (hence the “source is no longer online” note on the Ravelry page). I’ve updated my post to reflect this – thank you for letting me know!